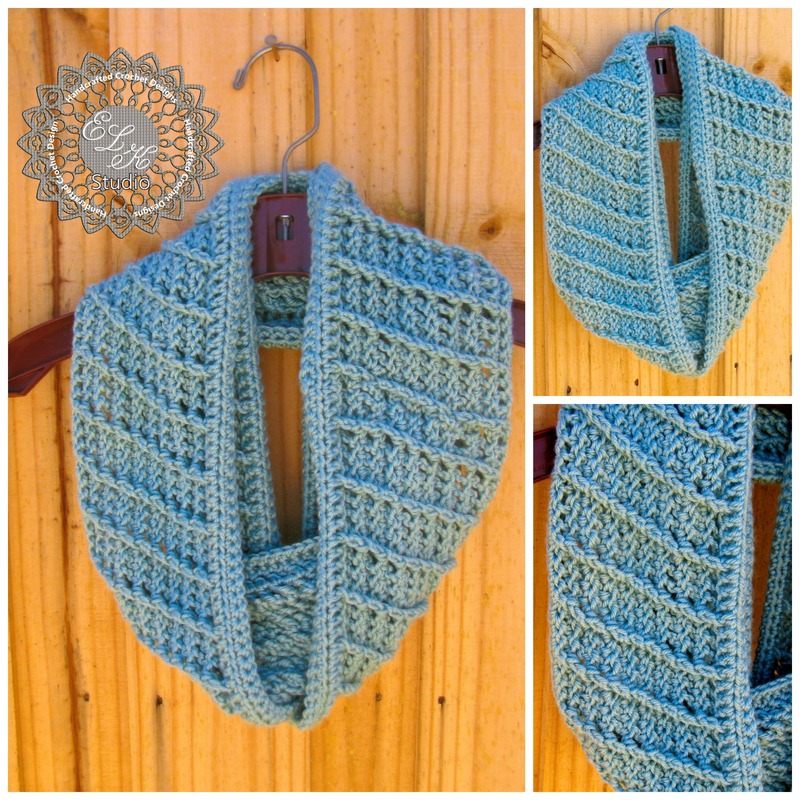 Country Appeal – A Free Crochet Infinity Scarf Pattern! UPDATE: 02/03/2014 – Country Appeal Beanie is now available to match the infinity scarf. Enjoy! Over Christmas I had a really good friend ask me to make some crochet gifts for her family members. She wanted two scarfs and two snoodies for some wonderful women in her family. Elena from Beatrice Ryan Designs had just released her beautiful snoodie, so no problem there. It worked up wonderfully without flaw. Sorry, I didn’t take “formal” pictures before sending them off, but you won’t be disappointed in the results. Anyway, I sat down with my yarn, Red Heart Soft, and starting working with some various stitches and came up with something that my friend loved! I’ve finally had the time to sit down and write down the pattern to share with everyone too! The infinity scarf is super easy to make and easily adjustable to fit the length and width you want as long as you follow a couple of key ingredients! #1 Key Ingredient – as long as your chain length is divisible by 4, you are good to go. For example, if you want to change the length of the pattern use numbers like 80, 100, 120, 140, 160, or 180. #2 Key Ingredient – if you want your scarf thinner or wider just make sure that you follow the first 5 rounds of the pattern and the last 3 rounds of the pattern. Rounds 6-11 can be reduced or increased without causing any issues to the pattern. Here’s the pattern for the scarf that you see in the photo. Red Heart Soft, or any worsted weight #4 yarn, 530-560 yards. I used 2 full skeins of yarn and a small amount of a 3rd skein. If you want to only use 2 skeins, you could drop a hook size from the recommended hook size. I’m not sure gauge is really that important since the scarf is so easily adaptable, but 6 dc and 3 rounds of tr rounds equal 2 inches. Ch 4 is considered first tr throughout the pattern. Join the first ch, ensuring that your chain is not twisted, sl st to first ch. Round 1: Ch 1 and sc in first ch and each ch around, join with sl st to first sc. Round 2, ch 1 and hdc in first sc and each sc around, join with sl st to first hdc. Round 3: ch 3, dc in next hdc and each hdc around, join with sl st in top of 3rd ch. Round 4: ch 4, tr in next 2 dc, fptr around post of dc in the previous round, *tr in next 3 dc, fptr around post of dc in the previous round*, repeat from *to*, join with sl st in top of 4th ch. Round 5: ch 4, tr in next 2 tr, fptr around post of tr in the previous round, *tr in next 3 tr, fptr around post of tr in the previous round*, repeat from *to*, join with sl st in top of 4th ch. Round 13: ch 1 and hdc in first dc and each dc around, join with sl st to first hdc. Round 14: ch 1 and sc in first hdc and each hdc around, join with sl st to first sc. I hope you enjoy this pattern. As always, please do not use my photos as your own! Feel free to sell your hard work made from this pattern. I ask that if you share it on any social media that you please provide a link back to me. If you print the pattern, please keep my header information on the print out. If you are on Ravelry, you can add this to your favorites for easy access, and it also will bring it to the front of Ravelry for everyone else to enjoy! Thanks for the support! Is there a video for The Country Appeal Infinity Scarf Scarf? No ma’am. I don’t have a video for this pattern. What part is giving you trouble? I really love this pattern but I have a question regarding the pattern. After you do the fptr do you place a tr in the next dc stitch? I wish I can upload a photo so you can see what I am talking about. Any help will be great. The fptr stitch actually leave the top of that stitch open right? You won’t be crocheting into that stitch but the next stitch. Does that help you? Thank you so much. It didn’t look right too much space in between. I love those patterns myself. I’m a bit confused about the first instruction: Join the first ch, ensuring that your chain is not twisted, sl st to first sc. Do I join and then slip stitch around? Or just join to the first CHAIN (not sc) stitch and then start SCing? After chaining 1 etc after slip stitch do you turn or just keep going around? Just learning how to read crochet patterns… Followed many videos and always have turned after chaining .. When toycare making the brim, you will ch 1 and turn but after you join the brim together You wont turn after joining with the sl st on the body of the hat. In the picture, this doesn’t look folded and doubled around the neck, but mine is really long. Is it meant to wrap twice? It actually is folded in the picture, but a little tucked. I did design it to be long so that it would wrap around at least once. Greetings, how would I make a straight scarf with this Beautiful stitch pattern!? Thank you! Crochet infinity scarf is the best. Scarf made from crochet is so soft, comfortable, and it helps you keep warm. Thanks for the tutorial; it helps me to pursue to do this kind of pattern. Thanks Kathy, looking forward to more of your tutorials. In the pattern you will see 2 asterisks(*) in the pattern. See the instructions below. That means you will do the instructions beginning with the first part of the instructions and contintue, but when you begin to repeat the instructions, you would not start at the very beginning again. You will begin with the first *for repeating the pattern to continue all the way around until the end of the round which at that time the 2nd * would apply. ch 4, tr in next 2 dc, fptr around post of dc in the previous round, *tr in next 3 dc, fptr around post of dc in the previous round*, repeat from *to*, join with sl st in top of 4th ch. What a wonderful gift you’ve given!!! Scroll to the bottom of the pattern. You will see a print button. I am actually a crochet and knitting illiterate, I cannot and never have I been able to understand the working and instructions for patterns. but I can follow pictures. it there anyway you can show a picture guide or tell me what the basic pattern is called so I can look up a how to video. I currently don’t have any pictures or videos for this pattern. It may be something I consider in the future. Thanks for the interest and leaving me a comment. Thank you for the Country appeal Beanie Pattern Kathy. I can not wait to make them! Kathy, I love your scarf pattern but I would like the hat that goes with it. Where can I find the Hat pattern? I’m working on the hat pattern now and hopefully it will be released this week so stay tuned! Ok I will. Thank you Kathy. I’m going to start one right now! It’s a beautifully textured design and I just happen to have some Red Heart Soft Yarn in gorgeous teal! Thanks so much for letting us use your pattern!! Your creativity is the kind of stuff that keeps me motivated to crochet!! Love this pattern…can I ask what color Red Heart Soft you used? Is this Mid Blue? Thank you so much. The color is Sea foam. I love everything about these lovely items! I also admire then way you write out your patterns. You did a great job here, Kathy. Thank you. I really like the textured design you used in your infinity scarf 🙂 Excellent Design Kathy! Thanks Rhondda!! Have a great day!! Love it Kathy!! Can’t wait to make one! Thanks Mistie! I would love to see it when you’ve finished!! Thank you Victoria. I have a group called ELK Studio – From the Heart. We get together and make donations to different organizations each month. Maybe we could do something together in the future. What’s not to like about this County Appeal Infinity Scarf by my friend over at Elk Studio. This scarf will not only go with jeans and boots but you can dress it up also. Take a look at the picture and the pattern. I know you will love it as much as I do. I love this design. I pinned it so I don’t forget. Thank you so much. Thanks for the pin!!! Enjoy the pattern, and I would love to see your scarf if you make one! Awww. Thanks.. You are so welcome! Enjoy! Kathy thanks once again for sharing your talent. I love they way you take plain stitches and turn them into something lovely. Kathy as always your patterns are lovely always using a combination of simple stitches in a new way. Thanks for sharing your talent. I absolutely love this Infinity Scarf Kathy!!!!!! I will have to make one!! Thanks for the mention about the Snoodie too!~!